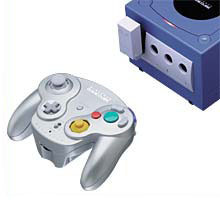 We had not seen so many official accessories since the NES era, from controllers to Game Boy adapters, the GameCube has them all and we have the full list for you. This is the basic memory card to save games. It has 4 Mbits of flash memory and hosts up to 59 blocks of saving. 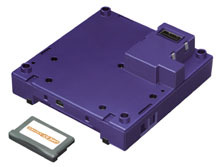 A couple of games have one included in their package (Animal Crossing, Pokemon Colosseum...) However, in 2004, Nintendo decided to discontinue the production of this item in favor of the higher capacity model 251. The current standard memory card improves over the former model by storing 251 blocks of data, more than 4 times its capacity. The last of the three memory cards offers 1019 blocks of saving space, 4 times more than the model 251, 17 times more than the 59. However, this card is currently only available in North America. Note: a few backward compatibility problems have been reported with old third party games, consult Nintendo's official site for more information. 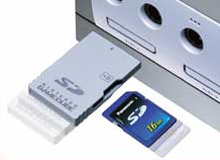 Designed as a standard memory card, the adapter is used to connect the SD card to the GameCube. The SD card (official site) has been invented and is produced by Matsushita. It works in various electronic devices such as MP3 players, laptop, video cameras and others. 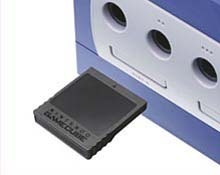 On GameCube, it provides a capacity 64 to 256 times higher than the memory card 59. Wireless controller using RF technology. There are 16 channels to choose from in order to allow other WaveBirds to be used at the same time. It requires two batteries and provide about 100 hours of playtime. 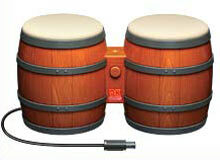 The taru congas, or bongos controller, replace the normal GameCube controller in a few games starring Donkey Kong. 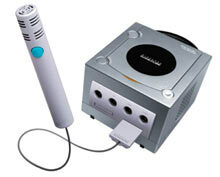 A microphone which connects to the controller plug for interacting in some of Mario Party 6's mini-games and giving orders to your troops in the upcoming Odama. The mat has the basic buttons of a controller, just move your feet on them. 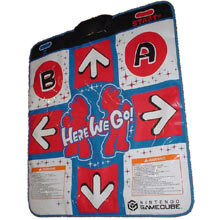 So far only used in the upcoming Dance Dance Revolution with Mario. 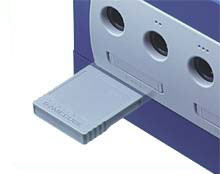 Connect the Game Boy Advance (standard or SP) to the GameCube and expand the possibilities of compatible games. 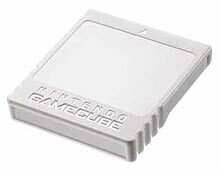 Each game offers its own way to benefit from the connection, among which: multiplayer modes, secrets and extras, GBA as a screen-controller, game downloads, and even functions from the e-Card Reader +. 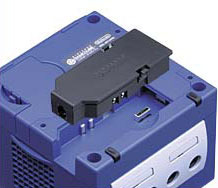 The Game Boy Player connects under the GameCube on the "Hi Speed Port". 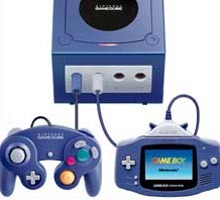 It lets you play on the TV screen, through the GameCube and its controller (or Hori's Super NES-like controller), all the Game Boy systems games: black and white Game Boy, Game Boy Color and Game Boy Advance. 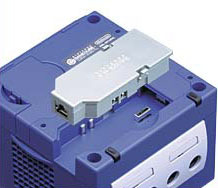 You can also use multiplayer or data exchange games by connecting other Game Boy Advance to the GameCube. 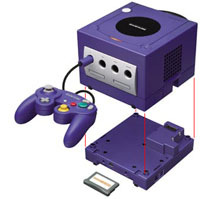 The Game Boy Player is bundled with a GameCube Player disk and exists in 4 different colors. A v.90 modem adapter for low-cost network access. High-speed broadband adapter allowing fast data transfer.